Spotlight Top Pick Veeva Systems (VEEV) beat earnings and raised estimates for next quarter. But the bullish temperature warmed up yet further when we spoke with the CFO, one-on-one. We added VEEV to Top Picks on 7-Dec-16 for $42.75. As of this writing it is trading at $98.639, up 130.85%. 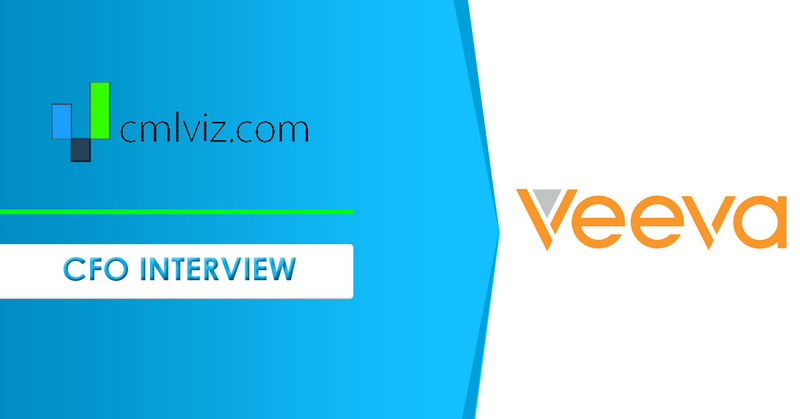 "It also supports their drive to harmonize systems which is a continuing trend we're seeing that's driving enterprise customers to standardize Veeva CRM globally." That's a fancy way of saying that Veeva is in fact becoming the standard, and that reality is pushing other life science companies to adopt Veeva. This is a gigantic trend if it follows through and is one that is crucial for Veeva. We thought it would happen - we did not think it would happen this soon. We are really proving that industry cloud can be an incredibly sizeable market. And the impact we can have is profound. Shares of life sciences cloud computing pioneer Veeva Systems (VEEV) were up after the company beat analysts' Q3 revenue and earnings projections, and also raised its forecast for this year's revenue above what the Street has been modelling. In an interview with CMLviz, chief financial officer Tim Cabral, and head of marketing Nitsa Zuppas, said they see a "multi-billion, very strong runway of growth ahead of us" once the company crosses the billion-dollar mark next year. "The remarkable thing is, we will hit a billion-dollar revenue run rate, and we'll be a year head of our target," said Zuppas. To recap, Veeva's revenue in the three months ended in October rose 27%, year over year, to $224.7 million, yielding EPS of 45 cents. That was well ahead of the Factset consensus for $216 million and 38 cents per share. For the current quarter, the company sees revenue of $226 million to $227 million, topping the average estimate of $222 million. EPS is seen coming in at 40 cents, also above the average 37-cent estimate. The company credited its "Vault" product, now 48% of revenue, which is a newer offering than the company's traditional "Commercial Cloud" software for customer relationship management. The company said Vault's total subscription revenue for the full fiscal year ending in January will now come in at about 45%, higher than the company originally expected, and well above the 10% or so rate of growth for the other half of the business, Commercial Cloud. Vault has spawned a plethora of applications that run on top of it, to help pharmaceutical companies run the different processes that take place in their drug trials and other efforts. The company has branched out in recent years beyond just the life sciences, to chemical and cosmetics and other industries, but life sciences is still the heart of the company's customer base. Said Cabral, there's plenty of growth to be had for years to come in that industry (our emphasis added). Given the size of the market within life sciences, we think we could get multiple billions [of dollars of revenue] from life sciences. Now, I'm not giving necessarily the mix of that revenue, when we hit that point, I don't want to give guidance here. But there is an opportunity for multiple billions of revenue from life sciences, especially given the market share we can get as the leader. Cabral and Zuppas also talked about the company's string of earnings beats since its IPO five years ago; the challenges of evolving a culture once a company hits a billion dollars in revenue; and the notion of "pattern recognition," being able to sense what is needed in an industry, such as the life sciences. Read the entire Q&A below (our emphasis is added). CMLviz: What are the most important things that you think that investors should focus on in the results and outlook? Tim Cabral (TC): I think there are a few things. One, just the continued, consistent execution, and the very strong performance from the team. Everything from product and services to sales and marketing, and the whole go-to-market approach, it was all strong across the team. Secondly, I would say our really strong clinical momentum in the quarter. You heard Peter talk about our having our first Top 20 customer purchasing CTMS [Clinical Trial Management System]. And also his commentary about CDMS [Clinical Data Management System], they are very important, very strategic parts of our business, and the progress and growth there are very strong. So the results were good from the Developer Cloud overall, but especially in Clinical. Nitsa Zuppas (NZ): We also gave guidance for net year, which is a really important data point. I think the remarkable thing is, we will hit a billion-dollar revenue run rate, and we'll be a year head of our target. We said three years ago, we let people know it was our aim to be at a billion-dollar revenue run rate by calendar 2020, so we're now a full year ahead of that. It's a huge milestone, and we now have it in our sights. We're now on our way to being one of the few multi-billion-dollar cloud companies. And we are in unique in having really strong growth and profit. You know, it's been five years since our IPO, this was our 21st earnings call. And we have exceeded top and bottom line, consistently, on every single call. Now we find ourselves looking at a billion in revenue, and beyond that. The thing we think about now, with a multi-billion, very strong runway of growth ahead of us, is that we are letting people know we will do that with 20% growth in subscription revenue. We are able to grow really strongly, at scale, and we've proven as well we can have best-in-class margins. TC: And I think the other important thing to add to what Nitsa said is that we have been able to invest in key new areas while doing all that, like CDMS, and like our initiatives outside the life sciences. So, the set-up is really good, with really good, consistent execution, good guidance, and good initiatives to invest in bringing us growth well beyond the 2020 time horizon. NZ: We have the first industry cloud, and that's a huge advantage. Knowing who we want to go after, what we want to build for them, having deep relationships with these clients. And, secondly, as you've written in past, we have a very strong asset in the Vault platform. We can enter new markets at incredible scale, and with tremendous leverage. That's a huge contributor here, when you look at both growth and profit. Q: Vault used to be a not very big part of the business, and now it's 48% of total revenue. So, is that view to 2020 "and beyond" mostly about the growth from here in Vault? TC: Also, when you think about the two, about Vault and Commercial Cloud, the growth of Vault at this scale is even greater than Commercial Cloud for a couple of reasons. One is the size of market that is on Vault versus Commercial Cloud, as we think about including the possibility of other applications outside of the life sciences, and even new applications within life sciences, that will be a much larger total addressable market than the total addressable market for Commercial Cloud. So, we're going after a bigger market with a lot of momentum. And then, to Nitsa's point about value and leverage of the platform that underpins all these applications, that is really driving the strong momentum from a Vault perspective. That is a bigger total addressable market for us. Vault will be a multiple in terms of revenue contributor compared with Commercial Cloud. We've thought about that all along. Q: So, should investors, as they look to that horizon of a billion dollars, and a multi-billion prospect beyond that, should they be thinking of that as mostly the growth in Vault? TC: CTMS and CDMS are built on top of Vault. Think of Vault as an application platform. Applications can be built with speed and at scale that can help both enterprise and SMB companies relatively quickly. Vault is what underlies, what underpins all that, and the acronyms - CTMS, EDC, eTMF ["electronic trial master file"] are all things built for specific business processes. So when we talk about growth in Vault, that will include the applications. When we sell you CTMS, you are buying the application CTMS, but you are also buying Vault - we use Vault as a shorthand, meaning, a Vault application. CTMS and CDMS are more recent components of Vault. And there are others. For example, we announced "Safety" a few quarters ago, and that's coming out mid-next year. So, again the technology platform is an underlying application platform we can build from. There are a number of applications today we have in the market, and we can build more over time, both for life sciences and for our initiative outside life sciences. Q: What changes as you become a billion-dollar company? NZ: Many years ago I was at Siebel [Systems, client-server CRM of the 1990s, early Naughts], and we went from 400 [employees to 5,000] and that was an adjustment. TC: One thing we think about as a management team is, How do we, at this scale, work with speed and be nimble? One thing we talked about is our philosophy. We run on the lean side, if you will, and we want to make sure we are not adding layers or superfluous resources to the business that would slow it down. NZ: And the big one I think about is, the strategic nature of the relationships you have really change over the course of time. You go from selling a single product to selling a solution to a whole area of the business. In our case, it maybe started with just an eTMF, a small subset of subset of the clinical process, and now it's across all of the operations, to really unify that, and across [a customer's] entire drug development process. The depth of the relationships, the trusted nature of those relationships. We had group of customers in here just today, four or five from some of the top Pharmas, sitting down, rolling up their sleeves on future plans with us. The fact that customers come to us, first, to ask if we want to solve a particular problem is a really wonderful place to be. We have delivered for them so consistently over the course of time, and really listened and responded. When you have that position in the market, you have to really carry yourselves, and think about who you want to be. You see some companies that have become market leaders, and they may not by carrying themselves with the focus on the customer. TC: Yeah, Nitsa makes a good point, they take advantage of that position, rather than understand they need to continue to build those trusted relationships. NZ: And we make sure that is known throughout the company, as we take on new people. TC: And to Nitsa's point, the other thing, at this scale, is when you are focused on this industry, in this case it happens to be very large, you become - you have a lot of pattern recognition. You understand the best practices in individual areas. We are playing that important role. We have the privilege of being able to play that role. As for the billion dollars, I don't know if the billion mark tips that, but the expectations for our ability to do that well becomes larger and larger. NZ: When you get to thousands of people [employees], going to tens of thousands, scaling a high quality team and a very strong culture, you have to have really the right people as well. Q: If we think about Veeva moving someday into the multiple billions of dollars of revenue, if you were to still be getting most, or a large part of your revenue from life sciences, that's something very unique, in my recollection. Most of the large enterprise software vendors of the last 20 years, like Siebel and Peoplesoft, were broad, horizontal companies. It's somewhat unique to get to be a very large software company and be focused so much on a given industry vertical..
NZ: Quite. Well, We've - and Tim can speak to this too, he was at Peoplesoft, which, I tease him it was really "back office" software, even though they had CRM! But, let sleeping dogs lie. The fact is, when we got to half a billion in revenue, and we were the second fastest after Salesforce to get to half a billion, back then people didn't even think it was a big market. That's when people first sat up and took notice. We are really proving that industry cloud can be an incredibly sizable market. And the impact we can have is profound. TC: Ironically, in 2015, when we talked about a billion [dollar] run rate [for revenue], people hadn't thought this could be a big business. It's really about the impact we can have on a very important industry, and, not to be too poetic, but one that is very important to society at large. NZ: You know, I managed one of the verticals at Siebel, and, no matter what we did in support of that, the whole company was not focused on that vertical, and we had 12 of them at the time. Q: So, is it conceivable that in the period when you cross over into the multiple billions of dollars, that most of revenue will still be coming from the life sciences? TC: That's not something we have necessarily talked about, and I wouldn't want to get into providing guidance here. But given the size of the market within life sciences, we think we could get multiple billions from life sciences. Now, I'm not giving necessarily the mix of that revenue, when we hit that point, I don't want to give guidance here. But there is an opportunity for multiple billions of revenue from life sciences, especially given the market share we can get as the leader. While this completes Tiernan's piece, the full story with added analysis and thematic trends is available on CML Pro.